Many of the best and brightest of the world are part of a dynamic duo: Fred and Ginger, Hall and Oates, Kermit and Miss Piggy — and the list goes on. It’s not that we think we are one of the best dynamic duos in history, but we might be close. 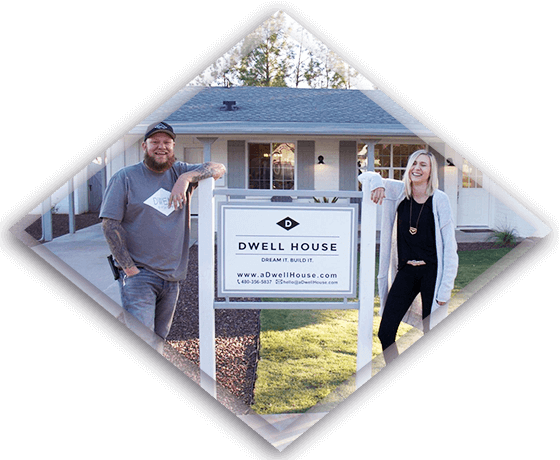 We’re Luke and Danielle, a husband and wife team dedicated to making your house fit your vision. From creating the perfect bathroom (complete with a soaker tub), to ensuring your kitchen suits your whole family, we are the crew for the job. From start to finish, floor to ceiling, we make the magic happen. Our team talks with you to determine what it is that will finally make your house feel like “home,” then we draft up a design. Once you give us the go-ahead, we start building. With incredible style and top-notch vision, we promise to bring your Pinterest-board-likes to reality. At the end of the day, our goal is to build and remodel kickass houses for the people in our community. If you don’t walk into your home and gasp with excitement, then it’s time to call Dwell House to make that happen. Work with the finest Arizona has to offer and contact us today. We promise to get to work the moment we fully understand your vision — and we do it all with a smile.